Earlier this month I spent a week in New York City. I had a great time taking photos and exploring New York, but I came to the quick realization that my travel photography gear was lacking. While I managed to get by, my trip would have been more enjoyable and less cumbersome if I had a more functional camera bag, a better camera strap, and a pair of shooting gloves. 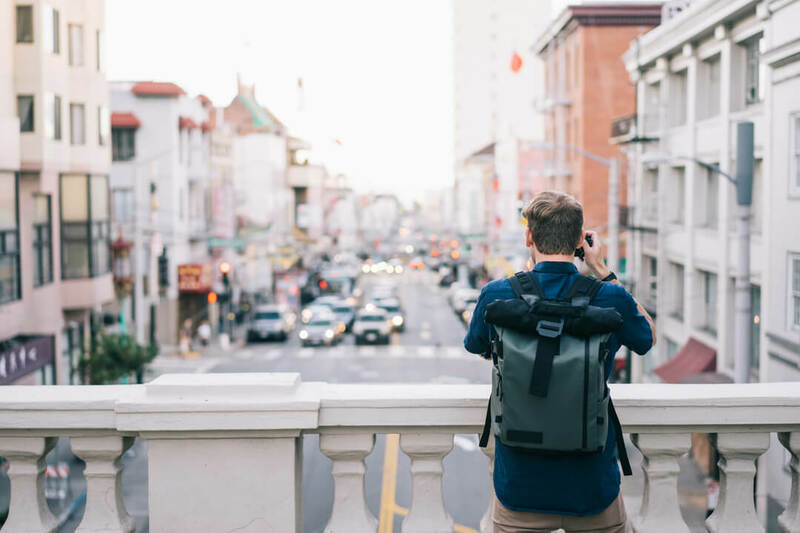 The WANDRD Prvke is a must have bag for any photographer that is planning on doing some traveling in the near future.Â This bag is rugged enough to take on the trails but still sleek enough to take with you in an urban environment. Â My favorite thing about this bag is that it doesnâ€™t scream â€œphoto gear,â€ making it less of a target for theft. The Prvke features a roll-top style that expands to fit your other traveling essentials. The side access allow for a very quick and convenient way to access your camera, and the zippered clamshell back makes it very easy to access all your gear at once.Â The zippered clamshell opening also makes this bag very airport and checkpoint friendly.Â This bag is extremely weather sealed so you wont have to worry about your photo gear when youâ€™re out in the elements. Another one of my favorite perks about this bag is the secure passport/wallet pocket. There is a small zippered pouch in the back of the clamshell so that your money and ID stay securely against your back keeping it safe from loss or theft. Another essential for any traveling photographer is a high quality camera strap. The Peak Design Slide camera strap is one of my favorite straps because of the versatility and comfort it provides. This strap can be worn 3 ways, sling style across the body, around the neck, or over the shoulder. The slide strap is a wider strap so it distributes weight more evenly and prevents the strap from cutting into your neck or shoulder. My favorite way to wear this strap is across the body because it relieves the pressure on your neck. The nylon material allows the strap to slide against your clothing so that you can easily move your camera up to eye level when you are ready to shoot. This strap also features quick release anchors that allow you to quickly mount your camera to a tripod. On my trip one major thing I overlooked was the importance of winter shooting gloves. A good pair of shooting gloves can make a world of difference when shooting in freezing conditions. The Promaster photo gloves provide great comfort for shooting in the cold winter weather. The index and thumb tips on these gloves fold back allowing you to have better control when operating your camera while still keeping your hands warm. After my experience shooting in the freezing temperatures in New York I will be sure to have these gloves in my kit for all winter photo outings. Â These gloves would have provided a much better shooting experience than my regular gloves. Donâ€™t make the same mistakes as I have. Make sure you are prepared for your next photo trip. Stop by any Creve Coeur Camera location to make sure you have the essentials for your next adventure. Better gear can make a huge difference for the comfort and enjoyment of your next photo outing.